Презентация на тему: "Made by: Shiryaeva Mariya 7-th A Orenburg secondary school 3 Teacher: Klunova Valentina Alekseevna.". Скачать бесплатно и без регистрации. 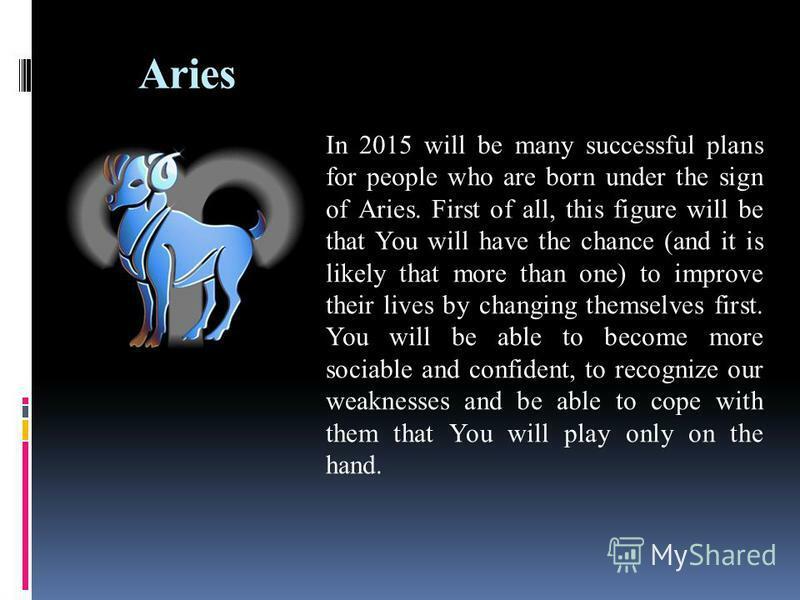 2 Aries In 2015 will be many successful plans for people who are born under the sign of Aries. First of all, this figure will be that You will have the chance (and it is likely that more than one) to improve their lives by changing themselves first. You will be able to become more sociable and confident, to recognize our weaknesses and be able to cope with them that You will play only on the hand. 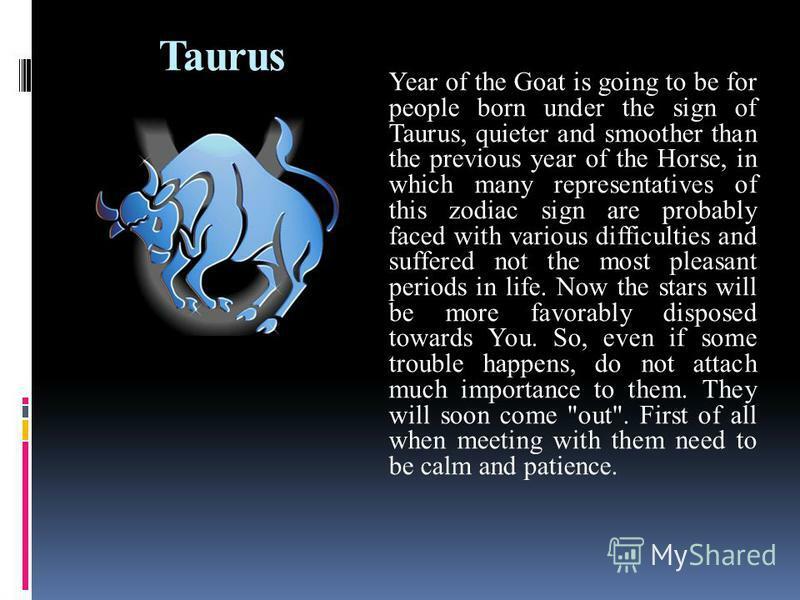 3 Taurus Year of the Goat is going to be for people born under the sign of Taurus, quieter and smoother than the previous year of the Horse, in which many representatives of this zodiac sign are probably faced with various difficulties and suffered not the most pleasant periods in life. Now the stars will be more favorably disposed towards You. So, even if some trouble happens, do not attach much importance to them. They will soon come "out". First of all when meeting with them need to be calm and patience. 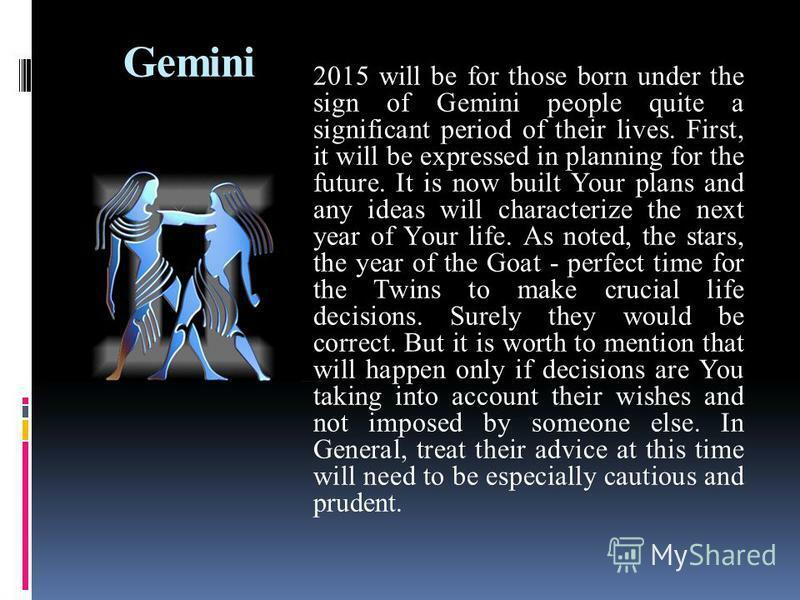 4 Gemini 2015 will be for those born under the sign of Gemini people quite a significant period of their lives. First, it will be expressed in planning for the future. It is now built Your plans and any ideas will characterize the next year of Your life. As noted, the stars, the year of the Goat - perfect time for the Twins to make crucial life decisions. Surely they would be correct. But it is worth to mention that will happen only if decisions are You taking into account their wishes and not imposed by someone else. In General, treat their advice at this time will need to be especially cautious and prudent. 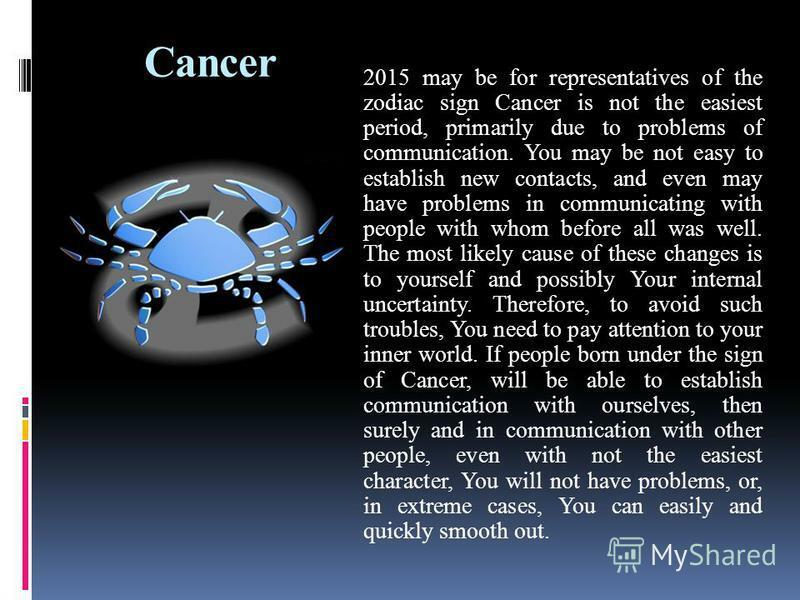 5 Сancer 2015 may be for representatives of the zodiac sign Cancer is not the easiest period, primarily due to problems of communication. You may be not easy to establish new contacts, and even may have problems in communicating with people with whom before all was well. The most likely cause of these changes is to yourself and possibly Your internal uncertainty. Therefore, to avoid such troubles, You need to pay attention to your inner world. If people born under the sign of Cancer, will be able to establish communication with ourselves, then surely and in communication with other people, even with not the easiest character, You will not have problems, or, in extreme cases, You can easily and quickly smooth out. 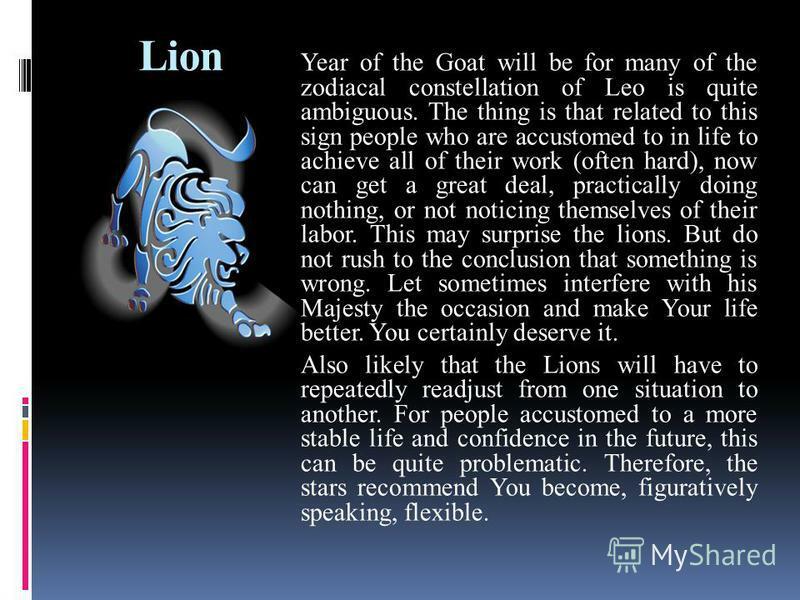 6 Lion Year of the Goat will be for many of the zodiacal constellation of Leo is quite ambiguous. The thing is that related to this sign people who are accustomed to in life to achieve all of their work (often hard), now can get a great deal, practically doing nothing, or not noticing themselves of their labor. This may surprise the lions. But do not rush to the conclusion that something is wrong. Let sometimes interfere with his Majesty the occasion and make Your life better. You certainly deserve it. Also likely that the Lions will have to repeatedly readjust from one situation to another. For people accustomed to a more stable life and confidence in the future, this can be quite problematic. Therefore, the stars recommend You become, figuratively speaking, flexible. 7 Virgo In many life matters Virgins (as in personal life and in terms of career) all will largely depend directly from themselves. 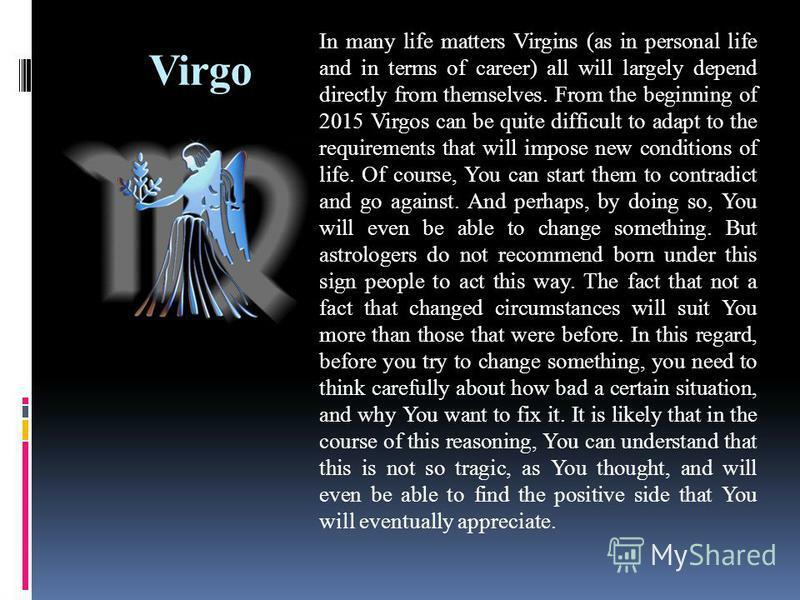 From the beginning of 2015 Virgos can be quite difficult to adapt to the requirements that will impose new conditions of life. Of course, You can start them to contradict and go against. And perhaps, by doing so, You will even be able to change something. But astrologers do not recommend born under this sign people to act this way. The fact that not a fact that changed circumstances will suit You more than those that were before. In this regard, before you try to change something, you need to think carefully about how bad a certain situation, and why You want to fix it. It is likely that in the course of this reasoning, You can understand that this is not so tragic, as You thought, and will even be able to find the positive side that You will eventually appreciate. 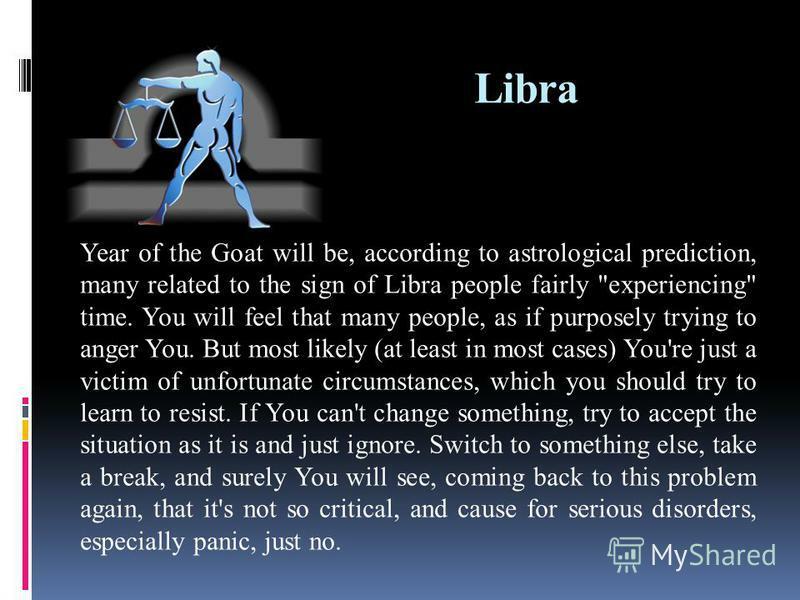 8 Libra Year of the Goat will be, according to astrological prediction, many related to the sign of Libra people fairly "experiencing" time. You will feel that many people, as if purposely trying to anger You. But most likely (at least in most cases) You're just a victim of unfortunate circumstances, which you should try to learn to resist. If You can't change something, try to accept the situation as it is and just ignore. Switch to something else, take a break, and surely You will see, coming back to this problem again, that it's not so critical, and cause for serious disorders, especially panic, just no. 9 Scorpio Many people who belong to this sign of the zodiac, according to the predictions of the stars, might want to part with the past (some situations, people, and so on). If You took this decision, then go forward without looking back. As he turned, again take a step back and stuck in the middle. It is important to learn how to go with a movie session, which does not bring You pleasure and to leave the people that cause pain. Even if the process of breaking up is painful, do You want to stay with this feeling for a long time? Perhaps once You will still want to leave. And than it will be later, the more painful. It is quite another matter, if You see the so-called light at the end of the tunnel. But then to change the situation to work (in all senses) in the first place will have the Scorpions. You must answer the question for itself: are You ready for this? 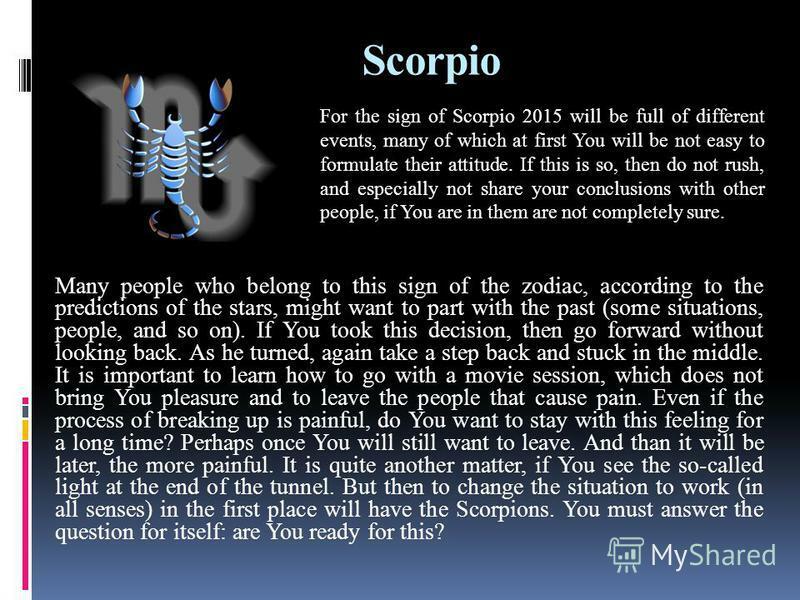 For the sign of Scorpio 2015 will be full of different events, many of which at first You will be not easy to formulate their attitude. If this is so, then do not rush, and especially not share your conclusions with other people, if You are in them are not completely sure. 10 Sagittarius Sagittarius in the year of the Goat will have the opportunity to make a step forward, and it is possible that in several spheres of life. And will You do it depends on 99 percent of Your desire and confidence that You want something. Circumstances and the surrounding people in most cases will not play a direct role (or, in extreme cases, You will be able to confront the situation), but, again, only if You realize that You need it. In addition to the inherent erudition and wit new year gives representatives of this zodiac sign and a certain cunning, which may, in some situations, You don't have enough. 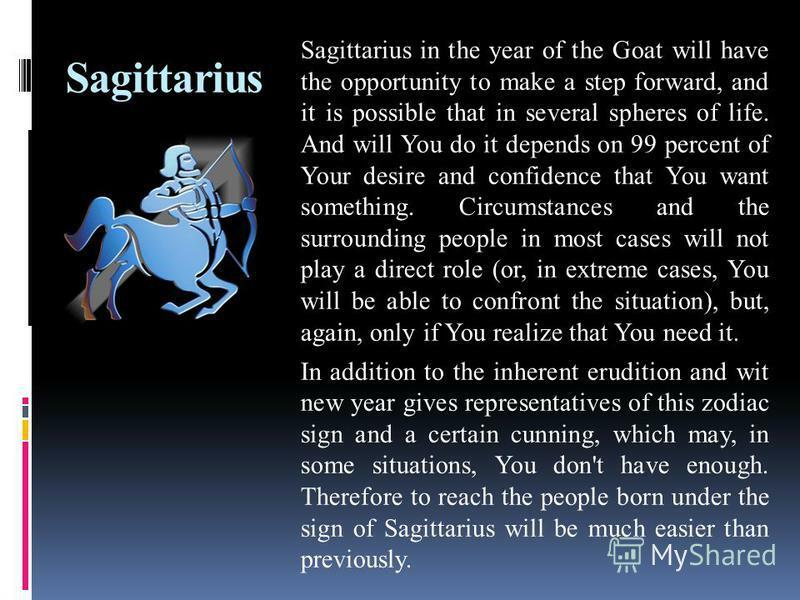 Therefore to reach the people born under the sign of Sagittarius will be much easier than previously. 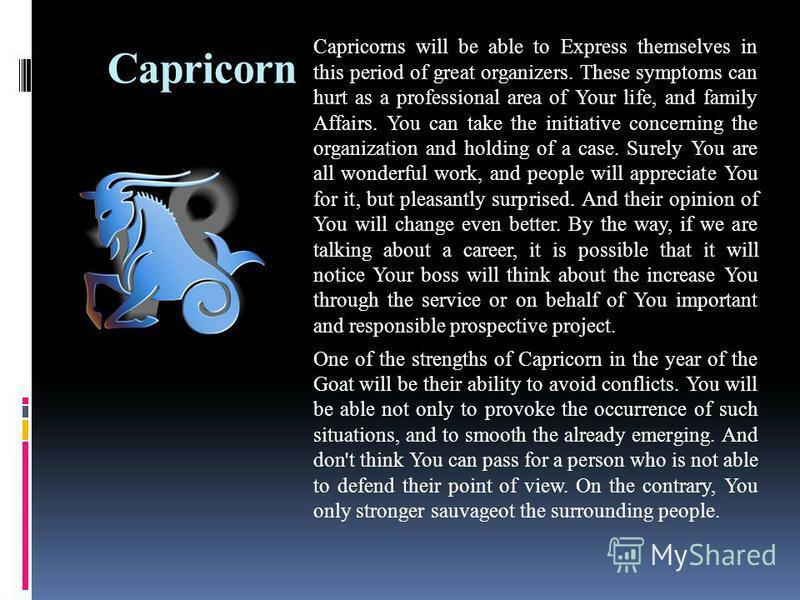 11 Capricorn Capricorns will be able to Express themselves in this period of great organizers. These symptoms can hurt as a professional area of Your life, and family Affairs. You can take the initiative concerning the organization and holding of a case. Surely You are all wonderful work, and people will appreciate You for it, but pleasantly surprised. And their opinion of You will change even better. By the way, if we are talking about a career, it is possible that it will notice Your boss will think about the increase You through the service or on behalf of You important and responsible prospective project. One of the strengths of Capricorn in the year of the Goat will be their ability to avoid conflicts. You will be able not only to provoke the occurrence of such situations, and to smooth the already emerging. And don't think You can pass for a person who is not able to defend their point of view. On the contrary, You only stronger sauvageot the surrounding people. 12 Aquarius People who are born under the sign of Aquarius, in the year of the Goat to come to many aspects of life quite rationally. Therefore, the failure of the non- global nature will pass by Your spiritual experiences. Because You will understand that nothing terrible or catastrophic happened, You're not going to pass through itself, that is certainly good. At the same time, You will be truly, heartily rejoice in the success, albeit not very large. You will learn to appreciate insignificant at first glance, things that can brighten gray days, from what Your mood, and in General attitude on life will change for the better. 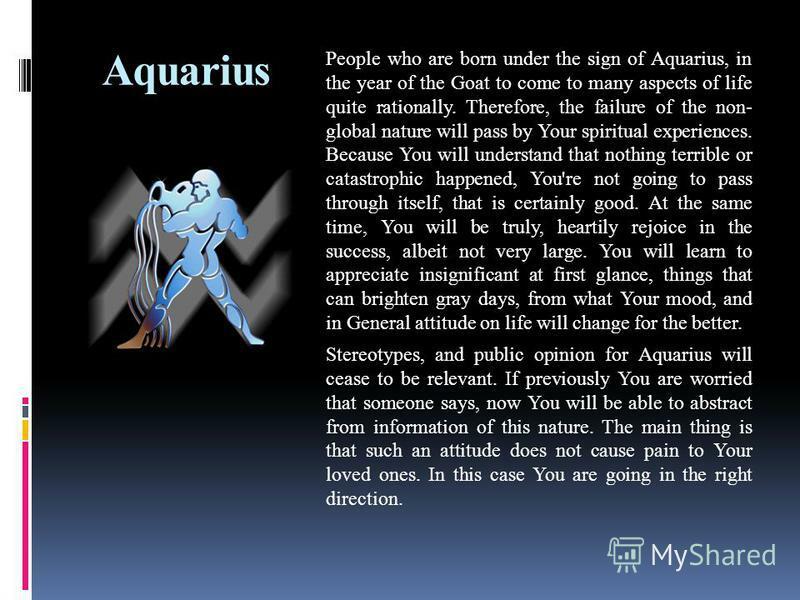 Stereotypes, and public opinion for Aquarius will cease to be relevant. If previously You are worried that someone says, now You will be able to abstract from information of this nature. The main thing is that such an attitude does not cause pain to Your loved ones. In this case You are going in the right direction. 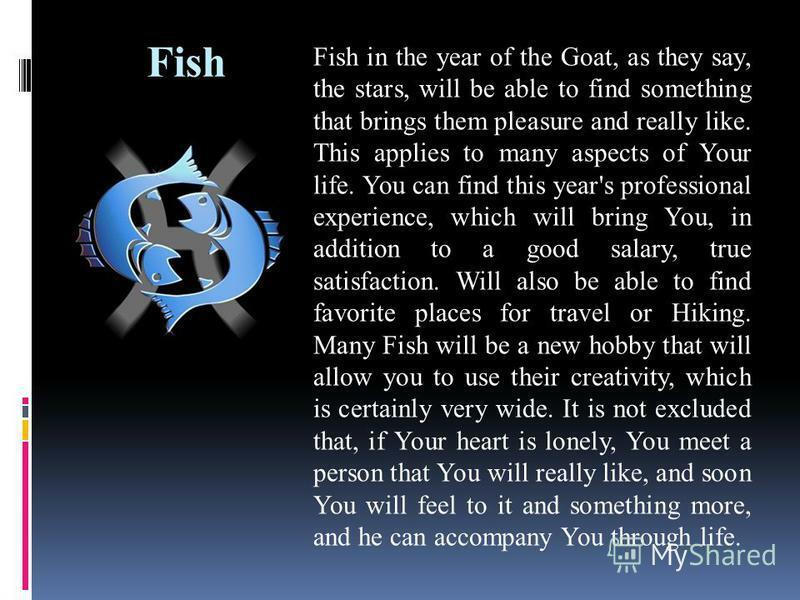 13 Fish Fish in the year of the Goat, as they say, the stars, will be able to find something that brings them pleasure and really like. This applies to many aspects of Your life. You can find this year's professional experience, which will bring You, in addition to a good salary, true satisfaction. Will also be able to find favorite places for travel or Hiking. Many Fish will be a new hobby that will allow you to use their creativity, which is certainly very wide. It is not excluded that, if Your heart is lonely, You meet a person that You will really like, and soon You will feel to it and something more, and he can accompany You through life. 5 STEPS TO MAKE YOUR FAMILY HAPPIER YOU NEED THIS! No School Please. I don't want to go to school today Everybody has days when they don't feel like doing something. Studying abroad. Many students choose to attend schools or universities outside their home countries. Why do some students study abroad? Use specific. Love And Marriage. You choose what life you would like to have You are a creator of your life. It can be a wonderful happy marriage or… Or you can get. Work Wonders Пашковская Т.А. Лицей 590. 1 I spend about half of my time in my office, and the other half in court. I don`t have customers. I have clients. What to expect? How to prepare? What to do? How to win and find a good job? BUSINESS ENGLISH COURSE NOVA KAKHOVKA GUMNASUIM 2012. Lesson 2. How to say hello & goodbye ?. When we first meet someone whether it is a person we know or someone we are meeting for the first time, we will. Describe a movie which made a strong impression on you. You should say: which movie it was – the name what the movie was about who the main stars were. THE MEDIA The mass media play an important part in our lives. Nowadays information is the most necessary thing. That is why there are so many sources. I and society. Plan Aim I in society Friends Classmates Student-teacher Parents and children Brothers and sisters Society in human life Conclusion Source. 1. Do toy like going to the dentist? Like many other people I dont like going to the dentist at all. Its quite painful, but if I have a toothache theres. Ecology and fashion. Project was done by Borodina Ludmila from 10 B. What points should we consider when choosing a career ? The project was done by Tatyana Lutsenko Form 11 A. A Legend School 16. T h e r e a r e f e w o f u s a n d w e c a n t s o l v e a l l t h e p r o b l e m s ! I t h i n k, w e s h o u l d s t a y h e r.